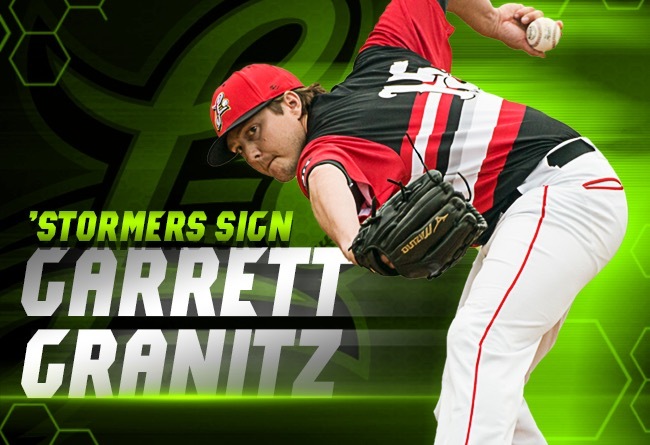 (Lancaster, Pa., Feb. 27, 2019) - Garrett Granitz, the popular right-hander who won the Barnstormers’ Community Man of the Year honor in 2018, has signed a contract for the 2019 campaign, it was announced today by manager Ross Peeples. Lancaster has also traded right-handed relievers Kevin Munson and Stephen Johnson to the Sugar Land Skeeters for two players to be named later. Granitz, 32, appeared in 45 games out of Lancaster’s bullpen in 2018. He posted solid overall numbers with a 1-1 record and 2.77 ERA. The native of the Madison, Wisconsin area yielded 40 hits in 43.0 innings of work while walking 23 and striking out 31. He yielded only one home run all season. Over his first 20 appearances of the year, Granitz compiled an ERA of 0.87 and earned a berth in the Atlantic League All-Star Game at Long Island. During the Division Series against Sugar Land, Granitz made three appearances, allowing one hit and two walks in 1 1/3 innings. Prior to coming to the Barnstormers, the Azusa Pacific product had pitched seven seasons in other independent leagues. He also had the opportunity to pitch in eight games for the division-winning Sydney Blue Sox this winter in the Australian League. Johnson, a Texas resident, went 3-0 with a 2.94 ERA over 43 appearances for the Barnstormers in 2018, his first season in the Atlantic League. Munson, 30, was 7-4 with a 3.57 ERA last season for Lancaster in his third season with the ‘Stormers.